Many Girl Scout members don’t realize that there is National Girl Scout Council that is charged with giving broad policy direction to the future of the Girl Scout Movement in the United States. The National Council, made up primarily of delegates from United State councils, convenes every three years to vote on business proposals, reflect on topics like women in corporate leadership positions and girl advocacy, and to have fun celebrating the Girl Scout Movement! As a Colorado delegate, we went to Fallapaloozas and held three webinars to obtain the opinions of the Girl Scout members in the state of Colorado on three proposals. We voted according to the feedback obtained across the state. The first proposal passed and authorized local councils to charge an annual council services fee for girl members. Our council is not going to charge a general fee (not to be confused with event-related fees for specific events like camp, council events or travel) at this time. The third proposal didn’t pass, but was sent to a task force. It was heavily debated as it would have created the ability of a council to have a rolling membership year for each girl that commenced on the date she first registered. Having been a leader for 8 years, I was interested in options for membership, but not the administrative nightmare of tracking each girl’s enrollment date! But don’t think this experience was all Robert’s Rule of Order. OK, a lot of it was. But there was some fun! The 12 girls who attended from Colorado sang songs as we walked through downtown Houston the first night. 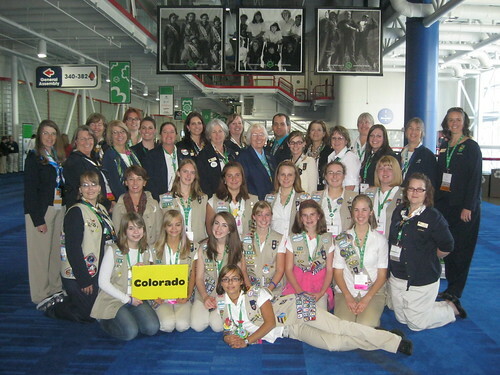 All the Colorado adults and girls who attended experienced courage, confidence and character in another part of the country and had the opportunity to feel the strength of the Girl Scout Movement. The program keynotes included Lifetime Girl Scouts such as Katie Couric and Robin Roberts. The official 100th anniversary kickoff event was a huge party, and the convention floor featured tons of great stuff for girls and leaders. If you’re interested in contributing in the same way in the state of Colorado, our Membership Connection Committee (MCC) is very active and looking for new members, particularly in the Denver metro area. Visit the Girl Scouts of Colorado website for more information. We’d love to have you apply, and maybe join us in Salt Lake City in 2014 for the next convention! Girl Scouts of Colorado announced today that it received a $75,000 grant from the Daniels Fund to support programming and volunteer recruitment initiatives to bring the Girl Scout Leadership Experience to more girls in the state. Bill Daniels, a pioneer in cable television known for his kindness and generosity to those in need, established the Daniels fund to provide grants and scholarships in Colorado, New Mexico, Utah and Wyoming. For more information, please visit www.danielsfund.org. Girl Scouts was founded nationally in 1912, and is today the premier all-girl leadership development organization in the country. Girl Scouts offers girls a variety of leadership-based programs and activities that promote self-esteem and confidence, life skills and academic skills, healthy lifestyles, team-building, community service and much more. Girl Scouts will be celebrating their 100th anniversary “Year of the Girl” during 2012, and invites Girl Scout alumna to reconnect with us by visiting www.alumnae.girlscouts.org. To learn more about Girl Scouts of Colorado, visit www.girlscoutsofcolorado.org or call 1-877-404-5708. Tomorrow, Dec. 6th, Coloradans will be invited to support their favorite Colorado non-profit to help raise millions in just 24 hours– including Girl Scouts of Colorado! This is our second year to participate in Colorado Gives Day. Last year generous supporters helped Girl Scouts of Colorado raise nearly $8,000, and we’d like to double that amount this year! Presented by Community First Foundation and FirstBank, every donation received on Dec. 6th will be increased in value by an incentive fund (up to a 30% match) started by FirstBank with a $300,000 lead gift. One hundred percent of your donation comes to Girl Scouts if you designate Girl Scouts of Colorado as the recipient of your gift. Make a gift this holiday season that will bring the personal power of the Girl Scout leadership experience to every girl, everywhere in the state of Colorado. At least a third of girls enrolled in Girl Scouts throughout Colorado are from economically disadvantaged, underserved and at-risk communities. In fact, in recognition of our wonderful President and CEO Megan Ferland, who will be leaving us later this month to assume the President and CEO post at Girl Scouts in Seattle, we’ve set up The Opportunity Fund, which will be the direct beneficiary of all Girl Scouts Colorado Gives Day funds. The fund will benefit disadvantaged and underserved girls, as well as honor the great work Megan did here in Colorado to build up and strengthen Girl Scouts and set us on a course of renewed growth and dynamic programming. Select your donation amount of $10 or more. You can donate with a credit card, or give directly from your checking account. Please be as generous as you can on this special occasion! You will receive an e-mail acknowledgement from Community First Foundation, and a gift acknowledgement letter from Girl Scouts. Girl Scouts of Colorado announced today that President and CEO Megan Ferland is resigning to accept the position of President and CEO of Girl Scouts of Western Washington, based in Seattle. Ferland has led Girl Scouts of Colorado for two and a half years; and under her leadership, the Colorado organization has made significant progress including achieving a 4.3% increase in membership last year. Ferland’s resignation will be effective Dec. 31, 2011. Girl Scouting builds girls of courage, confidence and character who make the world a better place. Girl Scouts of Colorado makes it easy, meaningful and fun for girls and volunteers to grow as leaders. We provide a safe place for girls to explore their world – from science, technology and the environment to healthy living, anti-bullying and financial literacy. For 100 years, Girl Scouting has been helping each girl develop her personal leadership skills and make friends that last a lifetime. Girl Scouts is also a great place to enhance job skills and give back to your community as an adult volunteer. In fact, we serve 30,000 girl members and 9,000 adult volunteers across Colorado! New to Girl Scouts are the flexible pathways for participation for both girls and adult volunteers. Come learn more about how you can be part of the Girl Scout Leadership Experience during our historic Year of the Girl 100th anniversary by visiting girlscoutsofcolorado.org, calling 1-877-404-5708 or emailing inquiry@gscolorado.org. That’s why Girl Scouts of Colorado is ramping up our focus on giving girls the confidence and tools they need to navigate those tricky situations they move through every day – programs like Power Up, to help them understand and defuse bullying situations, and Fight Like A Girl Scout, to help them recognize and act when they’re threatened. It’s why we’re involved with efforts recently like The Colorado Clothesline Project, addressing issues of violence against girls and women. (View photos and video from this event.) And why we’re planning a Feb. 23rd viewing of the film Miss. Representation , which explores how the media influences perceptions – and misperceptions – of women. As we ramp up these efforts, we’re looking to our community to support us by volunteering for one of these programs and/or making a donation to help offset the costs of providing them. To learn more about how you can volunteer for or donate, visit Girl Scouts of Colorado’s website. We’d also like to ask you to show your support by weighing in on a “healthy media” poll put together by the Geena Davis Institute, Girl Scouts of the USA and the Healthy MEdia Commission. This poll will hopefully get lawmakers and the entertainment industry thinking about just how much influence they have on building women leadership in this country. It’s sad that girls like my friend’s daughter feel so much pressure when they are so young. Girl Scouts is all about helping girls to see that their value isn’t in what they wear, what others think of them or the girl drama. Join me and Girl Scouts of Colorado in helping our girls grow up to be strong, brave, capable leaders. According to a National Institute of Justice & Centers for Disease Control and Prevention (CDC) survey, one in four women experience domestic violence in their lifetime. In 2008, Colorado domestic violence agency staff and volunteers answered 46,780 crisis intervention calls, a 20% increase from 2007. According to 2008 Liz Claiborne research study, one in four “tween” say dating violence is a serious problem for their age. 85,000 rapes were reported in Colorado in 2010, yet an estimated 60% of rapes go unreported. October is Domestic Violence Awareness Month, and Girl Scouts of Colorado is going to be part of an important project that starts this Saturday, Oct. 29th. We are collaborating with MidChix & MadHens, a social enterprise promoting the well-being of women & girls, on the Colorado Clothesline Project. This event will bring together hundreds of girls (6th grade and older) and women throughout the community to create a compelling T-Shirt art exhibit acknowledging the existence and effects of widespread violence against women and girls in our society, along with efforts to break that cycle via education and empowerment of our generation as well as the next. The hundreds of completed shirts will be part of a public art display in the South Gaylord Street neighborhood in Wash Park from Nov. 4th-6th. A public unveiling of the display will take place on Nov. 4th from 5-8 p.m. at Brushstrokes Gallery, 1059 South Gaylord Street, Denver. This isn’t the first time Colorado Girl Scouts have been part of this important conversation in our community. View the public service announcement one of our Colorado Springs Girl Scouts (also a Generation Wow! Girl Scout), Rebecca Nelson, created on this subject for TESSA to earn her the highest award in Girl Scouts, the Gold Award, this last spring. For more information on the Colorado Clothesline event, including how you can participate, visit our website. Girl Scouts of Colorado is hosting Open House Events at the Girl Scouts Service Centers around the state. Come learn about resources available for you, meet your Membership Manager, learn more about the Journeys and Girl’s Guide, taste the new Girl Scout Cookie, Savannah Smiles, and checkout the sample incentives for the Cookie Program. Pueblo, Denver and Fort Collins open houses are the weekend of Oct. 29 and Colorado Springs is Monday, Oct. 31. View the flier for more details. Girl Scouts of Colorado is hosting Open House Events at the Girl Scouts Service Centers around the state. Come learn about resources available for you, meet your Membership Manager, learn more about the Journeys and Girl’s Guide and taste the new Girl Scout Cookie, Savannah Smiles. The Grand Junction Service Center open house on Oct. 1 attracted close to 100 people who came to meet staff and check out the grand re-opening of the remodeled shop thanks to the aspen diversified construction efforts. in south Denver, announced the recipients of its quarterly charitable giving awards. Donations are given to organizations making a difference in the lives of families in the Denver metro region. Leawood Elementary School, a Jefferson County elementary school located in Littleton, Colo.
Alpine owner Ivette Dominguez (who has also been honored by Girl Scouts of Colorado as a Woman of Distinction honoree, or a leader in the community) began the program, called The Alpine Difference, in January 2011 as a way to better serve organizations in the community. Each quarter Dominguez and her team choose worthy charities to receive much-needed funds. Consideration for these awards is given to those groups or individuals that promote education, health and wellness, the concerns of women and children, anti-violence or safety. Click here for the latest news about ‘Girl’s Guide to Girl Scouting,’ 100th Anniversary, Journeys and Girl Scouts in Action.